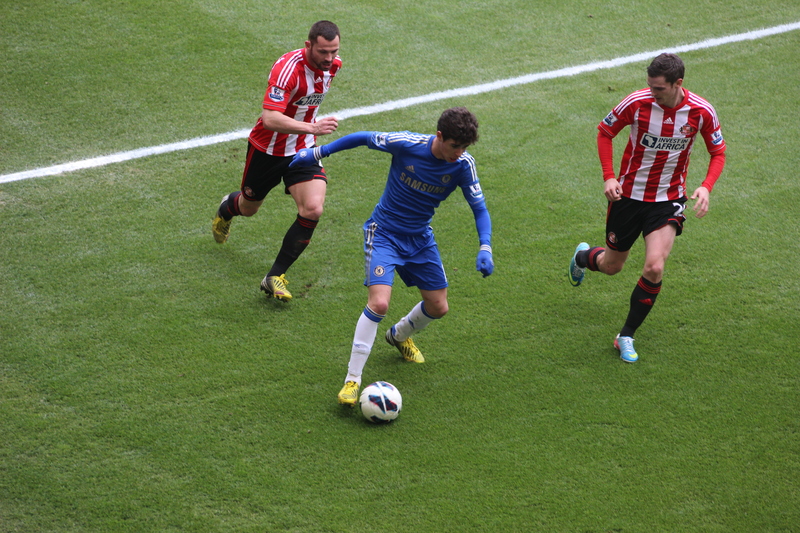 Chelsea vs. Sunderland : 7 April 2013. Our encounter with Sunderland was our third home game in just seven days; one in the F.A Cup, one in the Europa League and one in the Premiership. My football-watching over this period will be extended to two other games – and two other competitions – by the time Tuesday 9 April is completed. In addition to seeing these three Chelsea home games, I’ll be watching my local team in the other two. On the Saturday, I watched Frome Town lose at home to Bedworth United 3-1 in the Evostik Southern League. On the following Tuesday, I hope to see them meet Arlesey in the second-leg of the Red Insure Cup. This competition is the old Southern League Cup. Should Frome Town be successful, they will join a list of winners which includes Colchester United, Gillingham, Yeovil Town, Hereford United, Cambridge United, Burton Albion, Wimbledon, Barnet, Kidderminster Harriers and Crawley Town. All of these teams have been members of the Football League at one stage or another. A win on Tuesday – Frome lost the first leg 1-0 – will easily represent the club’s most major honour in its 107 year history. Of course, back at the start of the twentieth century, the Southern League was the southern alternative to the, mostly northern, Football League. Famously, Tottenham Hotspur became the only team from the Southern League to win the F.A. Cup Final in 1901. Infamously, Chelsea avoided joining the more natural Southern League in 1905 to join the more established Football League instead. Suffice to say, the Southern League has a rich history. That Frome Town should play in its premier division these past two seasons has been a fantastic achievement for the club, which exists on gates of between 200 and 250. However, my local club – who I first saw play in around 1972 – is currently mired in a relegation dogfight. On Saturday, we went 1-0 down in the first few minutes of the second-half and also had two players sent-off. A fantastic equaliser by Luke Ballinger, who also happens to be England’s futsal captain, levelled things, but two late goals sealed Frome’s fate. However, I enjoyed seeing my local side play. I very rarely yell “Come On You Reds”, though. I howled with laughter. Bloody relatives. Sadly, Parky was still unable to attend the Sunderland game. I set off for London and the weather was thankfully warmer. I was parked up at 11.45am and raced down to the hotel. Without wishing for this match report to turn into a parody of what has gone before, the time spent in the hotel foyer was typical of the past few years; I met up with visitors from the US, fed them a diet of awful puns, took photos of them with Ron Harris, while Peter Bonetti and Kerry Dixon were chatting in the background. At about 12.45pm, we walked down to Parson’s Green. The skies were pure blue, but with much warmer temperatures than the previous few weeks. As we walked past the white terraced houses, it was a lovely feeling that winter was, perhaps, behind us. As soon as I uttered these words I felt like apologising. I could tell that neither Greg nor George was familiar with our former player. I could see that they were enjoying themselves, though. The smoke from the barbecue out on the pavement was flavouring the atmosphere with a hint of summer and there was even a rather bedraggled and weather-beaten palm tree nearby. The beers were going down well; I even stretched to a second pint. I guess it was a celebration of the end of winter and the start of spring. Nicole was getting stuck into a fruity cider and asked Julie to assist in the second bottle. Now, I know that Julie never usually drinks, so I took great pleasure in having a joke with her. Sadly, it was soon time to leave the pub for Stamford Bridge. I wished them all well as we disappeared our separate ways outside the West Stand. I was able to briefly meet another Californian – John – outside the Ossie statue. He is over in London on work for a month or two and our paths, I am sure, will meet again soon. He himself was suffering from a drinking session from the night before. John Terry was dropped, with Ivanovic and Luiz in the middle. The full backs were the next generation; Ryan (jury still out) and Dave (improving match by match). Our midfield was strong; the strongest five in the circumstances? Probably, with a slight doubt about Oscar who is going through a slight dip.Up in attack, Fernando Torres was dropped and Demba Ba took his place. There were around 1,200 Sunderland fans in the far corner. If I looked hard, I could see that hundreds of seats dotted around the stadium remained empty. Unfortunately, I just missed Mike’s presentation to Mata. The first-half was a hum-drum affair. I always hope that first-time visitors to Stamford Bridge get rewarded with a fine game with a great atmosphere, but this game must have been a disappointing one for Nicole, Greg and George on both counts. At least their seats were exceptional; the very front row of The Shed upper tier. There were few Chelsea chances. Sunderland had a few attacks on our goal and I think that we were rather fortuitous with our defending. However, from a Sunderland corner, the ball fell into a crazily packed six yard box and was turned into his own net by Dave, who was under pressure from several Sunderland players. Here was that eerie moment when I could see that the ball was in the net, but all was quiet. Then, a split-second later, the Sunderland fans noisily celebrated. There were certainly boos and then moans at the break. Gary came over to spend a few moments with us; he was vehemently adamant that the in-form Torres should have got the start instead of Ba. His hatred of Benitez knew no bonds; I’ve never seen him so angry…well, not since the last game. Former Chelsea (and QPR, Arsenal, Spurs and West Ham) striker Clive Allen was on the pitch at half-time. He only played for us from December 1991 to March 1992 but scored some cracking goals. Fernando Torres replaced Ba, who was evidently still suffering from a Craig Gardner tackle, at the break. He made an immediate impact. The ball was played down the left touchline and, with the crowd roaring him on, Torres easily raced past the full back. We have rarely seen this trademark acceleration while he has been with us; it evidently is in his locker, but I wondered why we seldom see it. He spotted Oscar square and played him in. Mignolet advanced and blocked the shot. There were, at first, howls of derision. However, to our joy, the ball rolled square and hit the hapless Kilgallon on the back of his shin. With another Sunderland defender already having back-peddled and lost his footing and having ended up in the goal, but unable to scramble to his feet, the ball apologetically rolled into the goal. Oh boy. It was the funniest goal I’ve ever seen at The Bridge. A second was just around the corner. From a corner, the bouncing ball broke to Luiz outside the box. He took a swipe at the ball, but the shot was deflected in via Branoslav Ivanovic’ foot. Was it intended? We weren’t sure, but we didn’t care. 1-0 down, 2-1 up…here comes the summer. Sadly, no more goals were forthcoming and the game became predictably nervy towards the end. Over in the technical areas, the two managers – the fascist and the fattest – were getting more and more animated. It was with some relief when the referee blew up for the final whistle. It was a poor game, but a big win. With Spurs only drawing at home to Everton, we climbed back up to third in the table. Our destiny for a third or fourth place finish is now in our own hands. I raced home, the sun still shining, and the music on the CD…after three consecutive home games, I was pleased to have a rest from driving for a week. However, for some, it turned out to be a long night. This entry was posted in Season 2012-2013. and tagged 2012-2013, Childhood, Pubs by Chris Axon. Bookmark the permalink.